The Chromium team have an automated build bot that generates builds every night; this short guide will explain how to get one of these nightly builds running in QEMU so you can try it out! 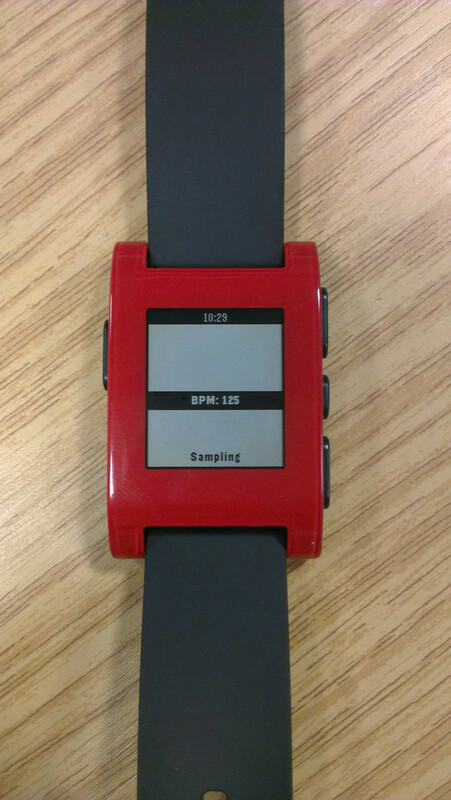 I’ve written a simple metronome app for Pebble (SDK 2.0). 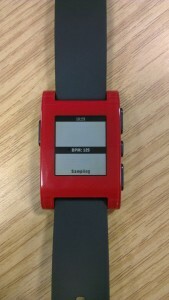 Press the select button (middle) to enter “sampling” mode – tap the pebble to set your tempo. Then press select again to get it to pulse at the tempo you’ve set. You can also increase/decrease the tempo with the up/down buttons. 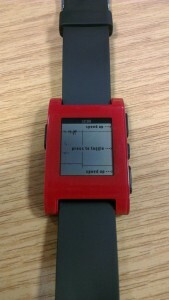 Seeing as I just got a Pebble watch, I decided to write a quick app for it, and seeing as Pebble have just released the (brand) new SDK 2.0 beta, I’d use some new features from that. It displays 3 graphs, X/Y/Z of current accelerometer values vs time, which you can increase or decrease the polling frequency of the accelerometer chip. I use Evernote for storing basically everything. Reference, notes, bookmarks (with notes about the bookmark), a journal (although this is a recent addition… we’ll see how long it lasts!) and some parts of my GTD workflow. It’s a fantastic tool with clients for Windows, Linux (Everpad, NixNote), Android, Mac, iPhone and of course, the web (where I use it most). 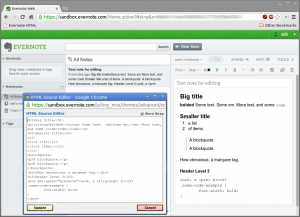 Signup to Evernote here and reward me with some Evernote points. Anyway, every now and again, I get a bit frustrated by the editor Evernote uses on their web interface – some little quirk of layout will start misbehaving (usually with nested lists) in the body of my notes. The editor they use is a customized version of TinyMCE, but there’s no button to switch to HTML view (as there normally is in TinyMCE) which I’d normally do to fix these things. However! 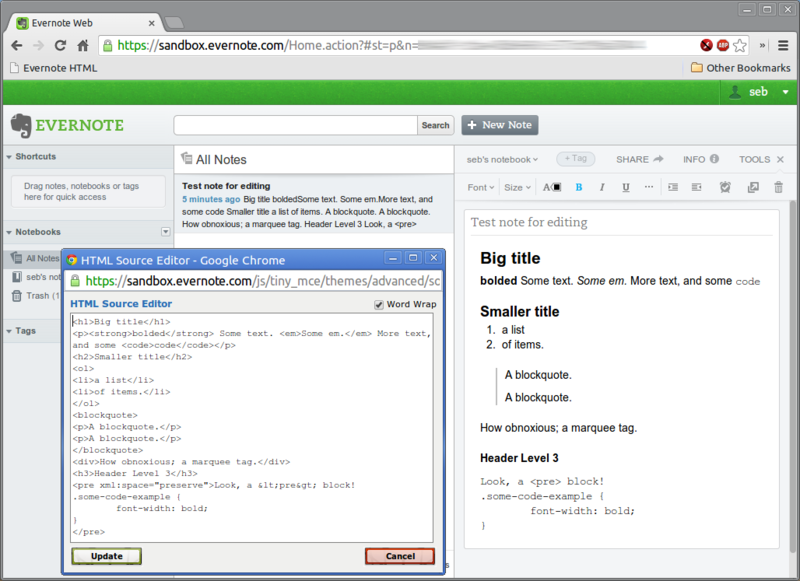 (and finally to the point of this article) you can inject events into a running instance of TinyMCE so that’s what this bookmarklet does – it sends the mceCodeEditor to the main Evernote editor (which happens to be the second instance of TinyMCE on the page) to let you edit the HTML source directly. Below is a simple UserScript (install with TamperMonkey or GreaseMonkey) to refresh the light OWA page and set the title of the page (tab) to the number of unread emails. I’ve only tried this in the light OWA mode 2010, but it seems to do the job, and refreshes the page once a minute. I like readitlater; but recently I found myself wanting to share some of my tagged items with other people and couldn’t find a way to do it. I used Delicious years ago and that’s always been a much more social app, so fired that up, and looked for way to import items. Unfortunately the export format of readitlater isn’t compatible with the import format required by Delicious; so here’s a quick python script to convert a ReadItLater exported html file to a file that Delicious’s import will accept. If you build Chrome extensions, you probably understand it’s a bit of a pain in the bum having to move all the files into the right place (especially if you have shared assets elsewhere), keep track of versions of your package, update your update.xml, and packaging it all up into a .crx and a .zip for publishing on the Chrome webstore. I found a it a pain in the bum anyway, so I wrote a bash script to simplify the build process a bit. It pumps out a .crx (signed with your .pem, ready for hosting on your site) and a .zip (ready for uploading to the Chrome Store). Google Music (or Google Play Music now!) is brilliant. It lets you upload 20,000 tracks to Google’s servers, available to play anywhere with a web browser, and streamable from your phone too. However, sometimes it’s good to be able to listen to your music when you haven’t got an internet connection – the Android Music client supports “make available offline” for tracks, but the webpage doesn’t yet – so I wrote a small Chrome extension that generates a list of wget commands (and mv commands) to automate the process of downloading specific tracks from Google Music, ready for play offline. A couple of months ago, I applied for a job. I’d been working for the previous 6 years in Java, and the job was a C++ post so I needed to learn C++ quickly – as a good project to get me going, I wrote a raytracer. I got the job, and I’m about 5 months in – looking back at the code I’d written for this starter project, it’s not great – I’ve already learnt a lot in that time, so I’ve rewritten it – and this time I targeted only standard, portable C++ so it compiled nicely (at least the core of the raytracer does) under GCC 4 with no libraries on any platform I fancied.